Updated, Jan. 20, 2009 Diagzán Saavedra Prat was released from prison after completing his 1-year prison sentence. 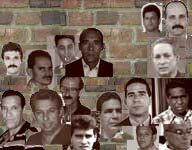 The political prisoner profiles and other reports posted here about the Cuban gulag would not be possible without the assistance of the political prisoners themselves. It's not that I have a direct conduit to them — they don't know me from Adam or José. But they make what I do on this blog possible by every day stepping out from within themselves and their own suffering to report, whether via telephone, a smuggled letter or the word-of-mouth of a visitor, what they are witnessing. I rely on Web sites like Miscelaneas de Cuba and Payo Libre for much of my information, but that information would never be available if not for the courage of their "prison correspondents" reporting from the depths of Castro hell itself. One of those correspondents is Diagzán Saavedra Prat, who recently reported on the poor conditions at the Cuba Sí prison in Holguín. The desperation felt by Cuban prisoners is exhibited by the case Yulián Rodríguez Fernández, who is ill with HIV/AIDS. After a prison guard told Rodríguez he could not stay in the prison infirmary and had to go back to his cell, despite the severity of his illness, Saavedra reported that Rodríguez stabbed himself 22 times in the right leg and abdomen, injuring his liver and a kidney. I don't know what Saavedra, an activist for the Eastern Democratic Alliance, did for a living before he was sentenced to 1 year in prison. But with these reports, he exhibited a journalist's eye for detail. But it's likely he is not a journalist. He's probably just another Cuban storyteller, like other prison correspondents, with too many stories to share about the hell he has witnessed. I am grateful to Saavedra and the others because without these storytellers, this blog would not exist.